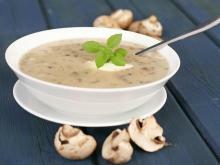 "A velvety soft cream of mushroom soup that caresses the palate!" Peel the potatoes and cut them into pieces, not too large though, in order to be able to mash them. Boil the potatoes and carrots. 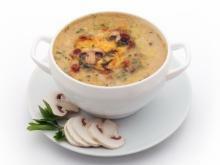 Shortly before being fully boiled, add the finely chopped mushrooms. Once the mushrooms are boiled, remove them from the heat and blend and dilute them with the broth in which you cooked the vegetables. Put them back on the stove and reduce the heat to medium, stirring frequently. After 10 minutes, add the dill, celery and black pepper, and after another 2-3 minutes, remove from the heat. The soup can be served with toast or croutons.